The Natural Eye, the annual exhibition of the Society of Wildlife Artists showcases the very best of fine art inspired by the natural world. Renowned for displaying a wide ranging collection of exciting and thought provoking work including sculpture, printmaking, painting and drawing there will always be something to delight and inspire you. The Out of the Frame room celebrates the tradition of working from life and will show a selection of field sketches and project work from member artists. The Natural Eye exhibition 2018 sponsored by Terravesta, pioneers of sustainable energy from miscanthus. Want to receive an invitation to the Private View, unlimited free entry to the exhibition for you and a guest with a complimentary catalogue, plus more? 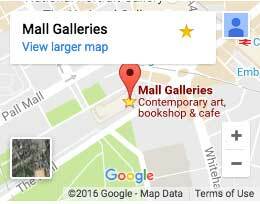 Keep up to date with what's going on at Mall Galleries by signing up to receive our e-newsletter. Willows Bird of Prey Centre are joining us with a few of their beautiful birds to act as life models. During The Natural Eye 2018, member artists from the Society of Wildlife Artists will be on hand to meet visitors. An informal talk by Jill Moger SWLA about what Hydrothermal Vents are and the life forms that thrive on and around them. Harriet Mead PSWLA will give a short informal tour of The Natural Eye 2018 on Thursday, October 25 at 2.30 pm. Artist Kittie Jones SWLA will present an informal talk about her experience on the John Busby Seabird Drawing Course, both as a tutor and a student.